Description: Arriving in the Cartersville yard. This was a really busy day on the CSX! Description: Local freight arriving in the Cartersville yard. Description: CSX Q105 rounds the curve through Madison. Description: CSX AC44CW 115 leads Q502 (Birmingham Al. to Cincinnati Oh.) across a farm crossing, along Gaithers Station Road. CSX 227 is trailing. 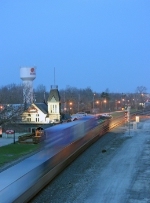 Title: CSXT 115-153, CP's River Sub.